The Premier League remains on course for a second consecutive season of record goal-scoring overall, but one new record has already just been set. The hat-tricks from Luis Suarez and Fernando Torres on Sunday mean there have been 19 trebles this season so far – more than in any season since the Premier League was reduced to 20 clubs in 1995-96. See graphic below for detail. 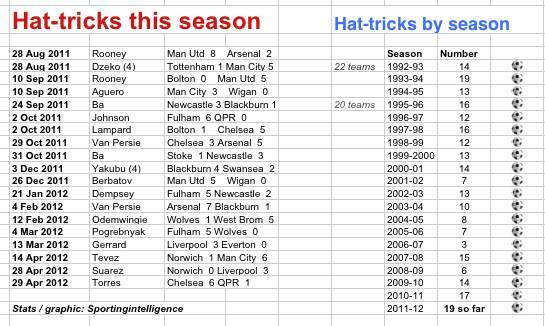 The 19 hat-tricks equal the all-time Premier League record for a season; the same number were scored in 1993-94 when there were 22 teams and 462 games (against 20 and 380 now). In terms of overall goals, there have been 997 in England’s top flight so far in 2011-12 – ahead of Monday’s Manchester derby. Any statistician worth their salt would have to point out there is a good chance of the season’s 998th, 999th and 1,000th goals being scored in that game. Manchester City have scored 87 goals in 35 games (2.49 per match) before the derby, while United have scored 86 (2.46 per match). Their 173 goals combined amount to 17.3 per cent of all the season’s goal by two clubs alone. Last season a record 1063 goals were scored in the Premier League. With 25 games left to be played (and 24 after Monday night), the present rate of goal scoring will deliver 1067 goals. Put another way, the 25 remaining games need to produce just 67 more goals for a new Premier League record over a 380-game season. Previous post In memory of Khalil Dale: my gentle, compassionate, tolerant friend. RIP.